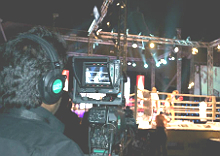 Best Broadcast Hire Dubai: Outside Broadcast (OB) facilities. 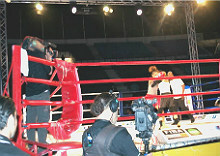 Best Broadcast Hire supplied its new Shooter6 OB van to cover the World Arab Boxing Championship held on March 31st and April 1st. The production included 9 cameras, 1 steadicam and full crew. The event was held at the Aviation Club in Dubai. The heavyweight champion Daniel "Danny" Williams - better known as "The Brixton Bomber" - highlighted the big event. BBH covered all the live performances including dances, fireworks and laser show which lit up the sky of Dubai. The event was broadcast to millions of homes via TV, radio and print.